True pistis [faith-allegiance] is not an irrational launching into the void but a reasonable, action-oriented response grounded in the conviction that God’s invisible underlying realities are more certain than any apparent realities. Stepping out in faith is not intrinsically good in and of itself, as if God is inherently more pleased with daring motorcycle riders than with automobile passengers who cautiously triple-check their seatbelt buckles; it is only good when it is an obedient response to God’s exercised sovereignty. We are not to leap out in the dark at a whim, or simply to prove to ourselves, God, or others that we have “faith.” But the promise-keeping God might indeed call us to act on invisible realities of his heavenly kingdom. If the call is genuine, we may indeed by bruised by the leap. Yet if it is genuine, in gathering the bruises from the hard landing, we can be certain that we will come to look more like the wounded Son, which is the final goal of redeemed humanity. If the call is not genuine but an idolatrous response to a false god of our own making, we may jump into the emptiness only to find ourselves unable to gain secure footing or to reverse course. 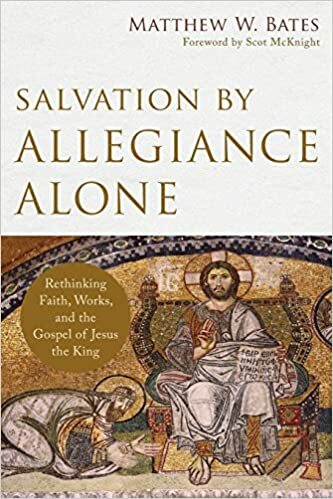 True pistis is not an irrational leap in the dark but a carefully discerned response to God’s reign through Jesus over his kingdom and that kingdom’s frequently hidden growth — Matthew Bates, Salvation by Allegiance Alone, p. 20. The godly are characterized by gladness. The doctrines of godliness are the doctrines of gladness.Â If it does not come at the last to gladness, then to hell with it.Â When the work of God is good and deep, then those who are redeemed from their depravity are happy to sing and talk about it.Â “And the ransomed of the Lord shall return, and come to Zion with songs and everlasting joy upon their heads: they shall obtain joy and gladness, and sorrow and sighing shall flee away” (Is. 35:10). When they really understand that God foreordained their wonderful salvation before the foundations of the world, they break into another song.Â Too often Christians debate the fact of predestination in such a way that both sides forget what a wonderful doctrine it would be if it were true.Â “Break forth into joy, sing together, ye waste places of Jerusalem: for the Lord hath comforted his people, he hath redeemed Jerusalem” (Is. 52:19).Â The real stakes in the real debate are joy and laughter…. We are sadly mistaken and think that fussiness is holiness.Â We think the Lord’s Day is for fasting when it is a feast.Â We think that psalms were given to mortify the flesh when they were in fact given for the overflow of the spirit.Â We think that predestination is a vast and impersonal machine grinding our bones into flour, when it’s nothing other than our loving Father involved in everything we say and do.Â In our poverty-stricken doctrine, our salvation was God’s little afterthought, and besides, we were not so bad to begin with, and so we have been forgiven little, and have received little.Â Not surprisingly, we love little and laugh even less. The way out is repentance â€”Â not a worldly sorrow that leads to death, but a godly sorrow that leads to repentance without regret.Â In another time of reformation, the people had to be reminded of the same thing.Â A return to holiness is always a return to joy and laughter.Â “Then he said unto them, Go your way, eat the fat, and drink the sweet, and send portions unto them for whom nothing is prepared: for this day is holy unto our Lord: neither be ye sorry; for the joy of the Lord is your strength” (Neh. 8:10) â€”Â Doug Wilson, “The Font of Laughter,” Angels in the Architecture: A Protestant Vision for Middle Earth, pp. 75-76, 77). Here’s a recent interview with N. T. Wright on the resurrection. Wright claims that many Christians today are weak on the doctrine of the resurrection, and my own experience would bear that out. I once preached on Christ’s ascension and had a man say to me, in some astonishment, “You mean Jesus still has a body in heaven? I thought he left it behind when he ascended.” I had similar experiences in catechism classes when we dealt with the resurrection. Look at what Paul actually says when he talks about how people become Christians. Look for instance at 1 Thessalonians where he says quite a lot about it without ever using the word justify or any of its cognates. He talks about the gospel coming to you in the power of the Spirit. You accepted that word not as the word of man but as what it really is, the word of God that is at work in you believers. It’s quite clear what Paul is talking about, that he comes into town announcing that Jesus is Lord, as a royal herald. He is saying that the crucified Jesus is the Lord of the world. And this is not, “Here is a way of salvation. You might like to apply it to yourself.” It’s not, “Here is a new way of being religious and you might enjoy it.” This is really an imperial summons: “On your knees!” Nobody ever went into a Roman town and said, “Caesar is lord and you might like to have this experience of acknowledging him as lord if that suits you.” They said, “Caesar is Lord, get on your knees and we want the tax right now.”And when that message is announced, some men and women find to their astonishment that they believe it. I say to their astonishment because it’s stupid. Paul says that it’s stupid. He knows it. You can just imagine it. It’s like someone telling a joke in a foreign language and not knowing why people laugh. Paul was going around the Roman world saying that this crucified Jesus is the lord of the world. He must have felt many times this is the craziest thing imaginable yet when I say it, lives are changed, the community emerges, people love each other. That is grace. And it is all of grace. But then the minute they say, “I really believe that Jesus is Lord, I really believe that God has raised him from the dead” and so on, then the doctrine of justification comes in and says you are all one in Christ Jesus. And, the proof is right there in Galatians 2:11-21. The first major discussion of justification is really all about who you are allowed to eat with. It’s not about how to go to heaven when you die.